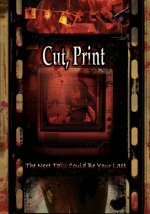 Cut/Print Movie Are you ready for your close-up? A group of ambitious filmmakers offer a serial killer anonymity to document footage of his grisly crimes to create the world's first reality horror movie. Cut/Print release date was Wednesday, October 31, 2012. This was a Limited in theaters release.